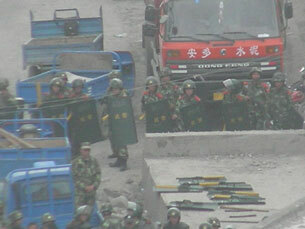 In a photo submitted by a local resident, police confront Tibetans on a road in Yarshul village, May 15, 2010. KATHMANDU—Fifteen Tibetans are injured, one seriously, and four are detained after Chinese security forces fired on them as they refurbished a road claimed by a Chinese-owned cement factory in northwestern Gansu province, witnesses said. "One Tibetan was hit in the chest and is said to be in serious condition. His injury could be fatal. All those injured have been taken to hospital," the witness said. What security forces were firing—rubber bullets, tear-gas, or live ammunition—wasn't immediately clear. 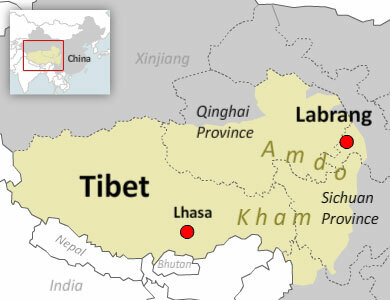 On May 15, Tibetans from Yarshul village in the Hortsang subdistrict of Labrang [in Chinese, Xiahe] were gathering to refurbish a road that had been taken over by the Xiahe Amdo Cement Co. Ltd., Tibetan witnesses said. At some point, company officials, police, and cadres arrived, and the county deputy governor told the Tibetans to leave within 15 minutes or face the threat of violence—but as the group was leaving, security forces arrived and fired projectiles at them, injuring 15 people, witnesses said. A police officer in the Xiahe Public Security Bureau confirmed that police had been dispatched to the factory. “I don’t know the details because I wasn’t on the scene then. But yes, we dispatched officers there,” she said. Another witness identified a group of Tibetans who had been taken into custody after the incident. "Four were detained. They are named Soekho, Jalo, Gonpo Lhundup, and Gonpo Thar. Chinese security forces arrived at the site and fired on the Tibetans," he said. Another source said that the Tibetan named Soekho escaped, and that another man, Tselo, was taken into custody. The detained men are being held in the Xiahe Police Detention Center, according to a Tibetan from the area who now lives in southern India. Relatives have been allowed to bring them food and bedding, he said. "There are posters up seeking information about Soekho's whereabouts," one man said, referring to the Tibetan who escaped detention. The cement factory, built in 1985, has irritated relations between Han Chinese factory owners and officials on one side, and Tibetan natives on the other, according to local sources. Tibetans also accuse the local authorities of failing to address their concerns about the factory, which employs hundreds of workers, uses a fleet of trucks that locals say blocks roads and snarls traffic, and discharges dust, smoke, and gases that pollute the environment. “The pollution is very serious. We cannot say anything bad about the cement factory, because if we do, we will be detained. Last year there was a clash as well, wounding many men and women,” the teacher said. One major point of contention, a local Tibetan said, was the damage done to a white pagoda—cherished by Tibetan Buddhists—by factory trucks carrying excavated stones. The factory, he said, was expanding and digging out tunnels. Tibetans have benefited very little from the factory, he said. “The benefit has been shared only by cadres. We’ve received very little. We villagers are very angry. Water in some villages has dried up," so that farming and livestock have suffered. A petition dated May 13, 2010, and signed by "all residents of seven villages," seeks redress from the factory for "polluting the environment, severely damaging farms and pastures, disrupting villagers' normal life, blocking village roads, and forcibly annexing village property, roads, religious sites, etc." It also said villagers had reported the issue to the relevant state environmental protection department and to central government media. How many people signed the petition and to whom they sent it were unclear as of Tuesday. Mining has also recently led to confrontations in Tibetan-populated areas. In Markham [in Chinese, Mangkang] county, in the Tibet Autonomous Region (TAR), Tibetan villagers staged anti-mine protests earlier this month in which at least five Tibetans were injured. Tibetans in Markham regard nearby mountains as sacred, and Markham last year saw demonstrations against mining at a mountain known as Ser Ngul Lo ["Year of Gold and Silver," in Tibetan]. Tibetans have historically worshiped at the site, conducting rituals there in the event of drought, residents say. Original reporting by Luboom, Dhondup Dorjee, and Chakmo Tso for RFA's Tibetan service and by Ding Xiao for RFA's Mandarin service. Tibetan service director: Jigme Ngapo. Mandarin service director: Jennifer Chou. Translated from the Tibetan by Karma Dorjee and from the Mandarin by Ping Chen. Written for the Web in English by Sarah Jackson-Han.